The Trendy Tot has beach babies covered! Be it at the pool or beach, when my youngest tells me he’s freezing cold I know he’s not going to sit still long enough to dry off and get warm. Short of hovering around his shoulders, I don’t stand a chance of a beach towel sticking to him! I’m completely relieved to find the Beach Terry Cover Up from The Trendy Tot. There’s a chance my sanity will remain intact all summer long with this poncho style cover-up. Made from completely organic super soft and absorbent terry cloth it’s a dream come true for keeping little bodies warm and shielded from the elements. 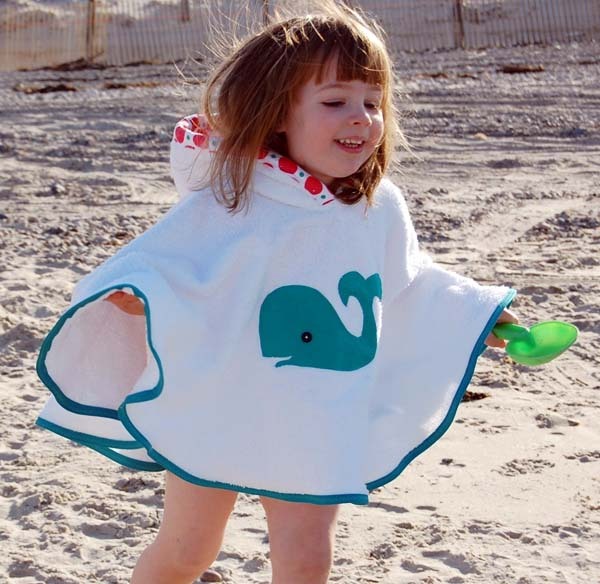 The wearable towel is trimmed with a contrasting cotton fabric and it even has a hood lined with a fun cotton fabric. Both girls and boys can delight in the five nautical themed designs – Red Lobster, Little Whale, Pirate, Anchors Away and Super Star Mermaid. Sizes fit from twelve months up to six years old, which is fantastic since this is when they seem to be most troubled by towel technique! Get yours for US$40 from The Trendy Tots. Delivery to Australia is available, just email for a quote on your order!